After dominant seasons where they led their respective classes in every major statistical category, Ken Roczen and Cooper Webb came into Budds Creek on the verge of the 450 and 250 championships, respectively, in Lucas Oil Pro Motocross. But while their huge points leads made the titles seem like an easy clinch, it’s critical to remember that odds were once stacked against each of them. That made these title clinches extra special to both. Let’s start with Roczen. 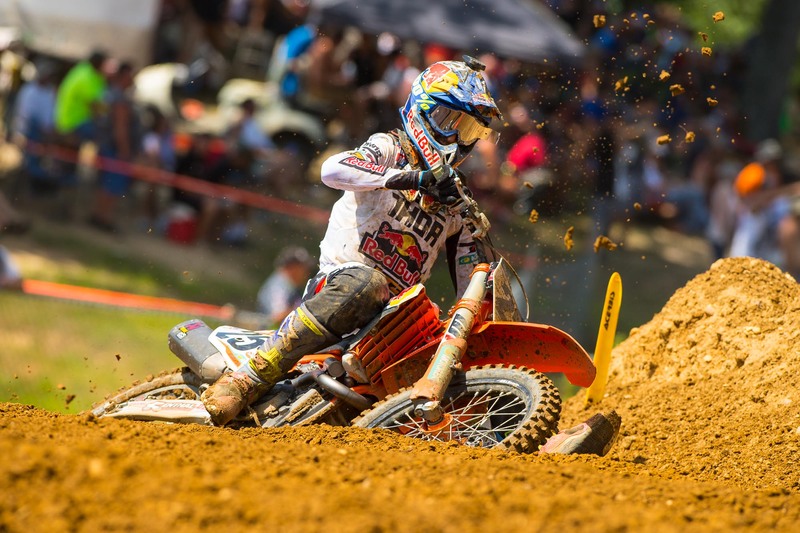 A rough 2015 title defense in his first go-around with Soaring Eagle/Jimmy John’s RCH Suzuki left many questioning his decisions—leaving the Red Bull KTM team he won the 2014 title with, and leaving renowned trainer Aldon Baker. But his 2016 season, a dominant one, left him with just one thing to do at the post-race press conference. When it was done, Kenny picked up the microphone, and then dropped the mic. The championship is also the first for the Soaring Eagle/Jimmy John’s/RCH Suzuki team, which is co-owned by Carey Hart and Ricky Carmichael. It’s the first time a privately owned team has won a 450 outdoor championship. How good has Roczen been? In 11 races, he has eight overall wins, eighteen moto wins (of twenty-two), eight 1-1 performances, and 294 laps led. Roczen entered the weekend 63 points clear of Monster Energy Kawasaki’s Eli Tomac, and while he didn’t need a 1-1 performance to solidify the championship, he went out and dominated the field, leading all thirty-four laps on the day. Roczen was never challenged in either moto. As we’ve seen so many times from him this season, Roczen was aggressive from the get-go, taking command early in each moto. He won the first moto by the tune of sixteen seconds and the second moto by twenty. 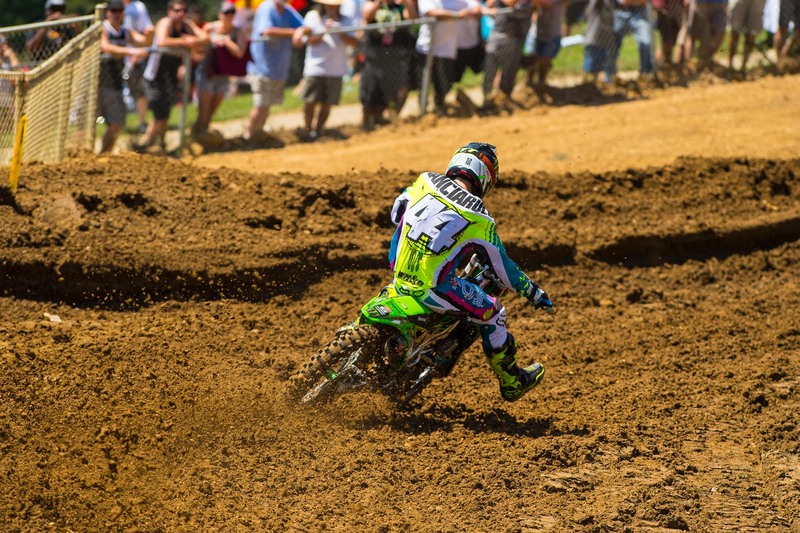 Last year, Justin Barcia used a muddy Budds Creek to turn his season around. Although conditions were much different today (hot, dry and humid) the AutoTrader.com/Monster Energy/JGR Yamaha rider was a solid third in each moto to take second overall. 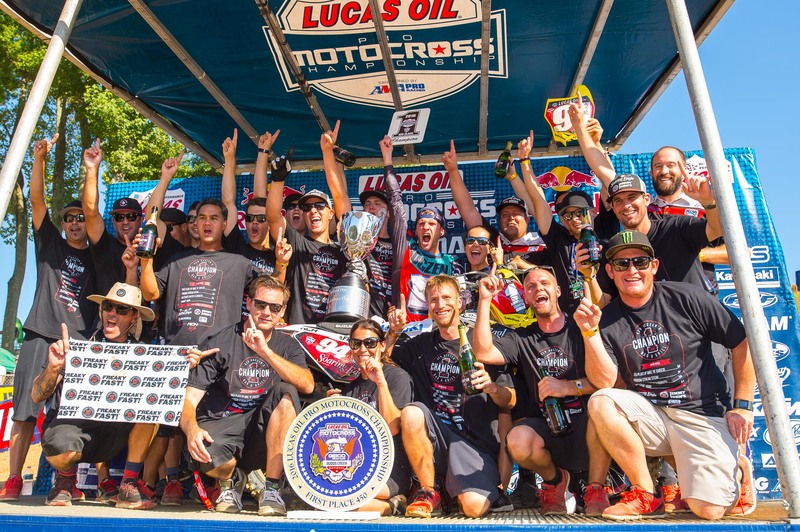 To get second overall, Barcia had to fend off Marvin Musquin, who got the better of him at Unadilla. Marvin also caught and passed Barcia in moto one at Budds Creek, but Barcia rode to the limit to hold him off in the second moto. Barcia said the second moto push—Musquin trying to catch him, and him trying to hold him off—was one of the gnarliest battles he’s had in a long time. Barcia put in a hard lap late in the race to stall Musquin’s charge. The duo showed good respect toward each other for the effort. Musquin racked up another podium today with third behind 2-4 moto scores. The 450 rookie has made huge strides in his first season, and has quietly moved into third in points, forty-nine up on Barica. A tough day for Eli Tomac, who crashed with Ronnie Stewart in the first moto (Tomac actually helped get Stewart’s bike off him before continuing) and could only work back to sixth. Tomac was much better in the second moto, but his start didn’t offer him a chance to challenge Roczen for the lead. Tomac rounded the first lap in sixth and once he worked into second (lap 4) Roczen was already long gone. He finished fourth overall on the day. 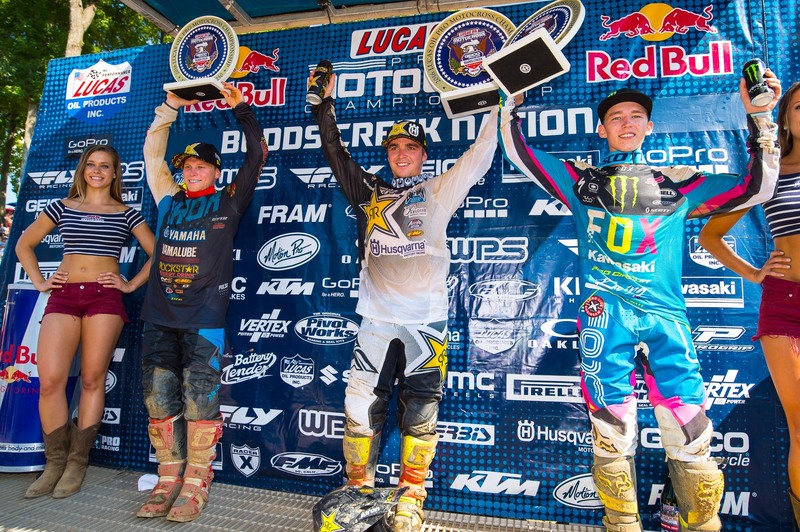 In the 250s, Cooper Webb entered the day with an 81-point lead, making the championship a virtual lock. But he added a little drama when he got a bad jump in the first moto and ended up down on the ground, and then crashed again on the first lap. From there Webb says he told himself to calm down and chill out, and he was happy that, on a track where it was hard to make passes, he made it all the way back for sixth. It wasn’t enough to lock up the title though, so he would have to wait until the second moto. There, he got a bad start again, rounding the first lap in around twenty-eighth. This time he found little trouble working through the field and finished a strong third. That was more than enough to win the title. The title seemed easy by now, but Webb pointed out some dark days when he first went down with a broken wrist before the Nationals began. “There was a big discussion coming in,” says Webb. “I’ve said it 100 times but, I was sitting there on the couch and I said, “I’m gonna’ win. I’m not just going to sit on this couch and drink beer all summer." I think a lot of people definitely thought I was crazy for thinking that. There were maybe only four people that agreed with me, that was Swaney (trainer, Gareth Swanepoel), my parents, and (Star Racing Team Owner) Bobby Reagan. I told myself last year after sitting there in Indiana and watching Jeremy [Martin] win I just decided I was not going to let that happen again. I just wasn’t going to be denied. I knew it was going to be tough and I wasn’t sure I wasn’t going to be able to do it. 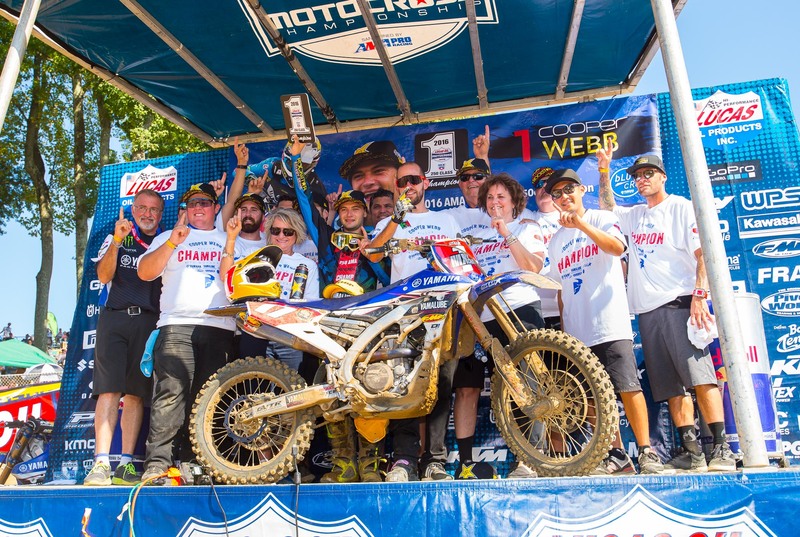 I just kept saying, “I want to do it, I want to do it no matter what.”"
The championship is the third straight 250MX title for the Yamalube/Star Racing Yamaha team (Jeremy Martin won in 2014 and 2015), who have come a long way under team owner Bobby Regan. Webb’s championship will overshadow Zach Osborne’s big day, but we shouldn’t let it. He spent the entire first moto battling with rookie Austin Forkner and ground out a fourth—admitting the heat and the battle took a lot out of him. But that fourth would loom large. In moto two, he was in another battle with Forkner but this time for the lead, and held on to win it. With moto one winner Alex Martin off to a slow start (he eventually finished fourth) Osborne’s 4-1 day was good enough for the overall win—the first of his career. 10 years ago this Budds Creek took a lot from Osborne, as in his rookie season he led the first 250 moto at this track for twenty minutes, only to completely run out of energy and fade all the way back to eighteenth by the end of the moto! Osborne said it felt just amazing and ironic to get his first-ever win at the track that had taken so much away from him. 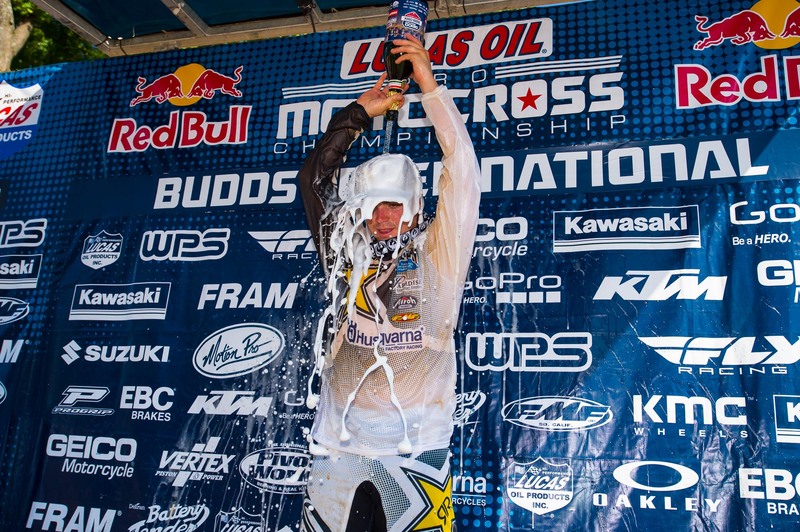 The win spells the end of a rough couple weeks for Osborne and his Rockstar Energy Husqvarna team. He went DNF-DNF last weekend at Unadilla, due to a mechanical (his third straight race that ended early due to mechanical problems) and a crash. Osborne didn’t realize the overall was his until his mechanic put it on the board on the last lap. Osborne actually thought Adam Cianciarulo had won the first moto (Adam actually finished second) and thought AC was in third, so he expected to lose the overall 1-3 to 4-1. But the first moto winner was actually Alex Martin, who struggled with a bad start, opening the door for Osborne’s win. But Alex was confused, too. He didn’t know he needed to make one more pass to get the overall (he would have had to get Cooper Webb to do it) and said he actually settled in behind Cooper. Then he got the board that he needed one more spot, but it was just as the white flag was coming out, making it too late to make a charge. Another solid day for rookie Austin Forkner, who led three laps in the second moto, before dropping back to second. Fokrner would finish third overall on the day, five points behind Osborne and Martin. Adam Cianciarulo was the early leader in both motos (he led eleven total laps on the day) but wasn’t able to close the door on a moto win. He went down late in the first moto while leading and although he made a late charge to retake the lead, he couldn’t make anything stick. After leading four laps in the second moto, he fell back to fifth. Still, a fourth overall is a positive. 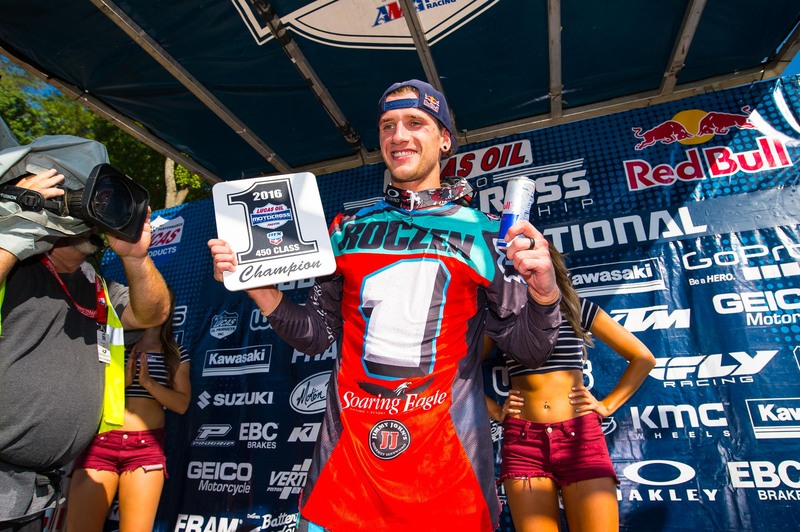 Ken Roczen clinched his second 450MX title today at the Budds Creek National behind a flawless 1-1 performance. The second moto was pretty much a carbon copy of moto one for Roczen. Veteran Andrew Short grabbed the second moto holeshot ahead of Roczen but the lead didn’t last long as Roczen quickly made the pass to take the lead. He never looked back and ran away to a 20 second victory. Eli Tomac was sixth after the first lap, but made his way into second by lap four after a hard battle with Justin Barica. He would finish the moto second and fourth overall. Barcia finished third, which was good enough for second overall ahead of Marvin Musquin. Dean Wilson finished the moto fifth, his best result since returning from injury. Phil Nicoletti took sixth, with Fredrik Noren, Weston Peick, Andrew Short and Benny Bloss rounding out the top ten. Eli Tomac rebounded from an early crash to finish sixth and push the 450 championship to at least one more moto. The moto winner was never in question. Ken Roczen took the early lead in the first 450 moto and ran out to a 16 second win over Marvin Musquin. Roczen has now won an incredible 17 motos (of 21) on the season and is just one moto away from clinching a second 450 title. Justin Barcia held second for the opening ten laps before Musquin put in an amazing charge to track down last year’s Budds Creek 450 overall winner. 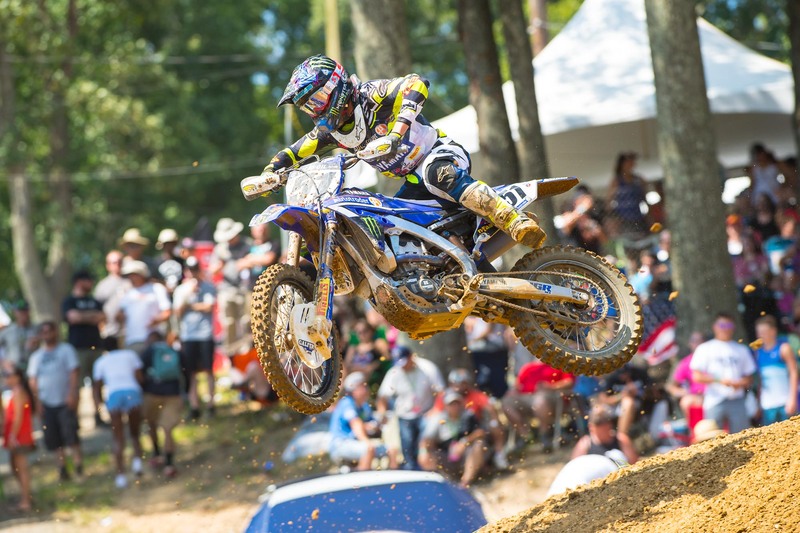 Barica’s JGR Yamaha teammate Phil Nicoletti finished fourth. Dean Wilson passed Andrew Short late in the moto for fifth to rob the veteran of a season-high finish. Short was also falter to Tomac late in the moto. Fredrik Noren took eighth and was followed by Matt Bisceglia and Anthony Rodriguez, who has been impressive in his move to the 450 Class. Benny Bloss finished eleventh ahead of privateer Heath Harrison, Kyle Chisholm, Cole Martinez and Noah McConahy. - Weston Peick suffered from a mechanical (appeared to be a clutch problem) in the moto. - Justin Starling made his 2016 Pro Motocross debut and finished 22nd. Series Standing: Roczen, Tomac, Musquin, Barcia, Pourcel. Cooper Webb will have to wait at least another moto to clinch his first 250 title. The 250 points leader had to work hard just to get inside the top ten after going down off the start and beginning the moto nearly dead last. Webb eventually worked all the way back to an impressive sixth, but it wasn’t enough to clinch the title. Adam Cianciarulo has led his share of laps in 2016—fourteen coming into the weekend—but he’s yet to close the door on a moto win. Early in the 250 moto at Budds Creek, AC was in complete control, opening a five second lead on Alex Martin, who won his first career moto here a year ago. But around the seventh lap, AC lost the front end in a corner, giving away the lead to AMart. AC wasn’t done fighting though, and actually closed to the rear-wheel of Martin. But after closing the gap to less than a second, Cianciarulo fell off the pace in the latter stages and finished 6.2 seconds behind Martin. Joey Savatgy, Zach Osborne and Austin Forkner rounded out the top five. Webb finished sixth, followed by Arnaud Tonus, Aaron Plessinger, Martin Davalos and Justin Hill. - Both Jordon Smith and RJ Hampshire had mechanical problems and were forced out of the moto early. - Chris Alldredge finished 12th in his first moto back from a fractured pelvis. Cooper Webb sliced through the pack in the second 250 moto to finish third, in the process clinching his first career 250MX championship—and third overall (two 250SX titles). After getting pinched off the start, Webb powered back from 28th to pass early race leader Adam Cianciarulo late in the race for third, giving him fifth overall on the day. The early story revolved around rookie Austin Forkner, who was blazing fast and passed AC and Zach Osborne to take the early lead. Osborne, who picked up his first career moto win at High Point earlier this year, was up for the challenge though and bounced back to reclaim the lead. He opened a gap late and won his second career moto by just over seven seconds. 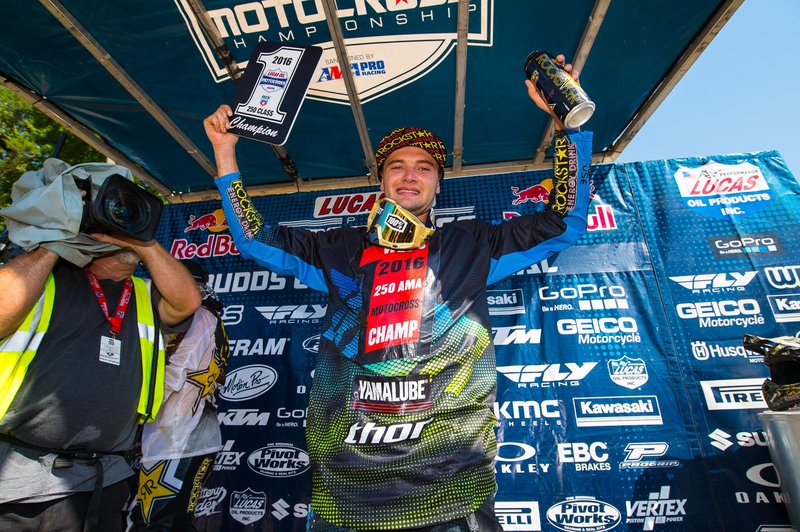 Behind a fourth in the first moto, Osborne won the overall as well—the first of his career. Forkner held on for second over Webb. 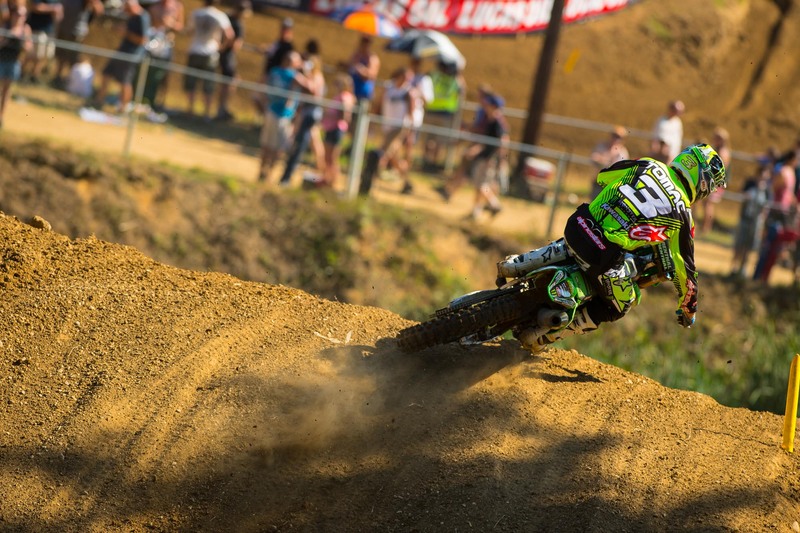 Cianciarulo finished fifth, one spot behind moto one winner Alex Martin. Aaron Plessinger, Justin Hill, Mitchell Harrison, RJ Hampshire and Mitchell Oldenburg rounded out the top ten. Overall: Osbourne, Martin, Forkner, Cianciarulo, Webb. Series Standings: Webb, A Martin, Savatgy, Forkner, J Martin.